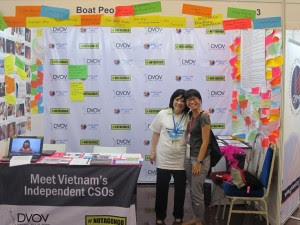 May 27, 2015 – Independent civil society organizations (CSOs) from Vietnam made their presence felt at the 10th ASEAN People’s Forum and ASEAN Civil Society Conference (ACSC/APF) in Kuala Lumpur, Malaysia, this April. While Vietnam’s presence remains heavily controlled by government representatives posing as CSOs, also known as Government Organized Non-Governmental Organizations (GONGOs), 2015 marked a significant dent in their legitimacy and stranglehold on one of the most important civil society forums in the region. BPSOS’s International Initiatives, which has had a regional presence since 2008, facilitated the participation of genuine CSOs from Vietnam. In total, independent civil society activists from Vietnam participated as key speakers and panelists on five workshops. “While it is hard to talk about, I felt it was important to share my story for everyone to hear”, says Vincent Phan, a torture survivor from the Con Dau Parishioners Association who spoke candidly in a workshop on torture about his past experience. Other panel topics with genuine CSO representation from Vietnam included indigenous rights, building a regional democracy movement, and freedom of expression. One CSO also had a short film selected for screening during a film festival held at the forum. Webcasting with live simultaneous translations took place throughout the forum, reaching an audience of over 400 participants scattered throughout Vietnam and elsewhere. Remote participants actively posed pertinent questions during plenaries and workshops. Unfortunately, interference only escalated during the conference. A series of pictures highlighting the brutal persecution against religious leaders in Vietnam was torn down before the first day of the conference. The vandalism took place at an interactive exhibit set-up by DVOV.org that aimed to serve as a space for genuine CSOs from Vietnam to meet their ASEAN CSO peers. Ms. Huynh notes, “While the vandalism was upsetting and shows just what lengths some people will take to suppress the truth, we were soon overtaken with good feelings from all the support we received.” The booth, which shared the independent CSOs’ latest statement and utilized a fun photo booth with the #NOTAGONGO hashtag campaign, was soon flooded with endorsing statements and overwhelmed with people taking photographs showing solidarity.